This set of knitting needle is made from carbonized bamboo. It makes a perfect gift for anyone interested in knitting. 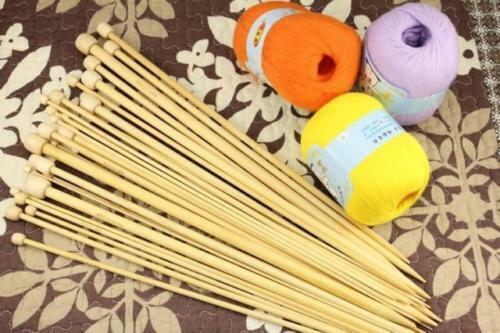 Single oointed knitting needles. Set of 18 pair of knitting needles. Made of carbonized bamboo. A wonderful set of every size needle you will ever need,supplied in a great case. very nice quality needles, Wood and bamboo is much nicer to use than the usual steel or plastic variety and they look good too. and will age beautifully over time like an old friend . I was really pleased when these arrived. Unfortunately on first use one of the needles (4mm) snapped about two thirds of the way down. As this is one of the most used needles I have had to revert to using my old needles (which are different lengths 😐). A real shame as the needles are lovely and light to use and eco friendly. These would be great for beginners, a very wide selection, they even give you spares for the thinner needles. They are very flexible and easy to work with. Good value, lot of variety. As I have arthritis (rheumatoid) but still like knitting these were ideal and warm to the touch. Only negative is I find it hard to work out the numbers. My sister bought me this set of needles for my birthday, they are very good quality, so good that I bought her a set for her birthday.